There are a number of food vendors who sell their wares on campus to ICS employees: we have the mushroom lady, the chicken lady, the pork butcher, the apple and pear guys, the bagel women, the cinnamon roll lady, and Michael the ice cream man. As of tomorrow I am joining their ranks. I am poised to become the Bread Lady. The various sellers all used to come to the school at different days and times but a few weeks ago the PTA came up with the great idea of rounding them up for a twice-monthly after-school ICS Farmers Market. I don’t have time to participate as a vendor, so my business plan is simply to bake as many loaves as I can and sell them from my desk in the library, first come, first served, until I run out. I’ll take orders in advance, too. I’ve had this idea in the back of my mind since last year. The kind of bread my family likes – the crusty, chewy variety – is nowhere to be found in Addis, so I make our own bread at home. A lot of my friends like it too and I sometimes bake it for them. It seems there is a market for it. The problem is, I can’t really do it for free on a regular basis because of all the time involved (after all, I’m a teacher, not a baker). And I don’t need a second paying job (again because I have a perfectly good one already), and anyway I couldn’t expect people to pay a price that would make it worth all the time involved. But over the summer a thought occurred to me. I’d be happy to invest the time to make and sell the bread, and people might be willing to pay the price that makes it worth it, if I just donated all the profits to charity. Duh. A private bake sale. I should have thought of that before. But better late than never. In August I ordered a case of bread flour from the commissary. The flour arrived a couple of weeks ago, but I still had to work out one last bit. I wanted to choose a recipient I really felt good about to receive any money the enterprise might generate. Now I have that as well. The school production of The Garbage King benefited a local organization called Our Father’s Kitchen, which runs three feeding stations for needy children affected by HIV/AIDS in Addis. Yasser Bagersh, the man who started OFK, came and spoke to our student actors at the post-show party last week. He won me over. A perfect fit for my product, too – bread for meals. If I sell one loaf of bread for 100 birr ($5.00), 30% will cover my expenses and the remaining 70 birr will buy 10 nutritious meals for hungry children. I’ve got 8 loaves to take to work with me tomorrow. Let’s see how it goes. This entry was posted in Addis Ababa, Food, Volunteering and tagged bread, community service, ICS Farmers Market, Our Father's Kitchen. Bookmark the permalink. Your bread looks awesome! Such a great idea to donate. I need to work on a plan for community service. Thanks for inspiring. hurray! i’ve heard about our father’s kitchen several times since you went over there, it sure does sound like an excellent organization, and perfectly fit for the project. and i have your recipe for that bread on the kitchen counter at this very moment, it’s damn good. I, too, thought your bread looked delicious and just the look of the rustic loaves that I buy from Sammy’s. But Sammy’s stopped offering their breads through the Medford Co-op and only supplies the Co-op and Shop ‘n Kart in Ashland and at the Growers Markets. Last week was the last market until mid March in 2014. So I was going to ask you for the recipe, but I see by Alice’s reply that all I have to do to get the recipe is to walk next door. 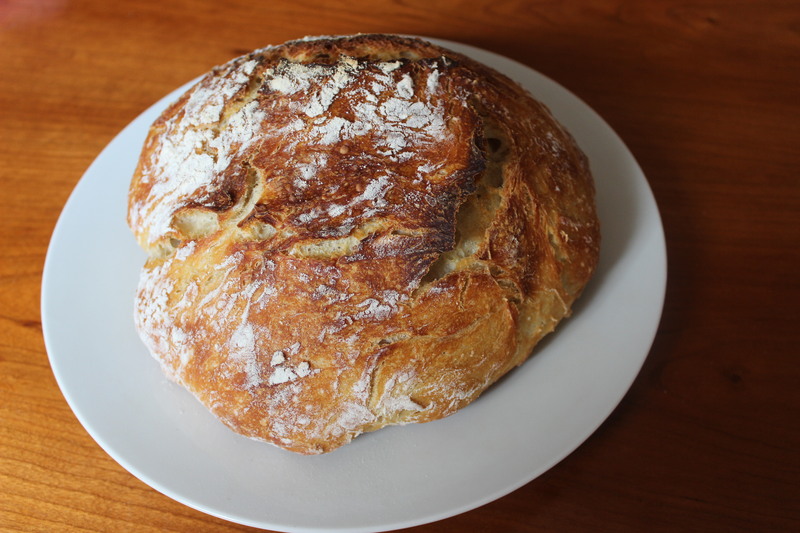 I am also a baker, and this loaf looks like the ones I’ve been turning out from Ken Forkish’s book Flour Water Salt Yeast, baked in a Dutch oven. Looks heavenly! You called it, Kathy! I got the recipe from an article in the New York Times in 2006, but I’m sure it’s the same bread (at any rate it’s the same four ingredients).